To start off the year I cleaned up my quilting room in the basement. I had a hard time giving up a quilt I made last year so I redid it and made it bigger. I used this one A LOT the first half a year while working around the house especially making supper with an Abigail on my back. This Quilt I still havent given away yet. It remains on my shelf. A friend wanted me to help her with this pattern and I loved it and made it fairly quickly. This was a new quilt for Zeke. I made this quilt for a friends daughter. The back was more springy and less Dora for her while she grows. 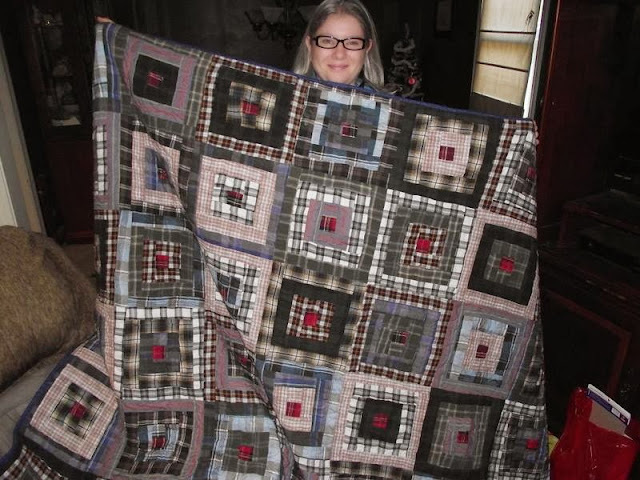 There is so much I love about this quilt and the person I gave it too. Baby quilt for an unexpected miracle baby. It was my first time doing circles. I went to a friends house and made some reuseable baggies. We went on a road trip and posted two blogs about some of my quilty adventures. 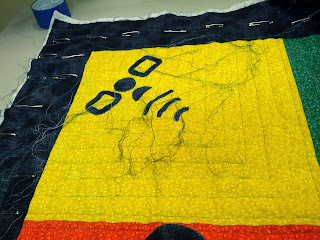 I didnt post any quilting blogs because we were on a road trip and camping . I got to go on my very first quilting retreat. It was a lot of fun! My second circle quilt and I did raw edge applique. A friend asked me about making a quilt from her daddy's pj pants. He had passed away. This is the design we came up with. Red was chosen to tie it all together because it was his favourite colour. Dave requested a geocaching quilt after seeing one at a geocaching event this fall. Jessica asked for a quilt from her Late daddy's button up shirts. I made her this (She picked the design) and 3- 12 inch block and a wall hanging. Jessica asked me to make a quilt with her daddy's shirts. He had passed away a year or so ago. She only wanted no pill fleece on the back and no batting. the quilting showed up nicely on the back! She also wanted 3 -12 inch block finished mini quilts and a small wall hanging.